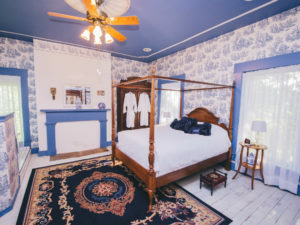 Lose yourself in the comfort of luxurious linens, triple-sheeted beds, and cozy, extra-heavy towels, which are standard fare in every room here at the Old Caledonian Bed & Breakfast. Named for Penny’s great-great grandmother Caroline Bean, a founder of the Village of Caledonia, this spacious room features a beautiful antique queen-size bed, an en suite full bath (including a luxurious claw-foot tub), and lovely views of our gazebo. Located on our second floor, this room also includes a flat-screen/satellite TV (including premium channels), wood finishes, and amazing high ceilings. 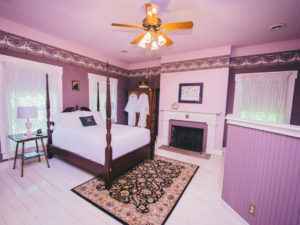 Named for the Scottish flower symbolic of luck – with purple tones to match – this spacious room features a beautiful antique queen-size bed, an en suite full bath (including a luxurious claw-foot tub), and lovely views of our gazebo. Located on our second floor, this room also includes a flat-screen/satellite TV (including premium channels), wood finishes, and amazing high ceilings. 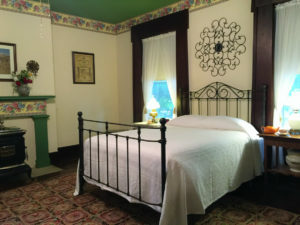 Named for Penny’s great-great grandfather Columbus Bean, also a founder of the Village of Caledonia, this spacious room features a beautiful antique queen-size bed, a private full bath (adjacent to room in the hall), and views of Caledonia’s quaint main street. Located on our second floor, this room also includes a flat-screen/satellite TV (including premium channels), inviting chairs and tables, wood finishes, and amazing high ceilings. Late Check-Out Policy: Late check-outs may be granted upon request and availability. Late Check-In Policy: If you are arriving after 6pm, please notify us so we may welcome you upon your arrival! Deposit Requirement: We require 100% percent payment of rooms at the time of booking. Cancellation: Reservations may be cancelled with a refund up to one week prior to first scheduled night of stay. A 3.25% cancellation fee will apply. Cancellations made within one week of first scheduled night of stay will be accommodated with a gift certificate, in the amount already paid, for future use at the Old Caledonian Bed & Breakfast. No-shows are not eligible for refund or gift certificate. No-shows for reservations made using a gift certificate will void said gift certificate. Parking: Please park in the private parking area at the end of our driveway through the gate (follow the signs). Please do not park at the property next door (the yellow house). If the entrance to our parking area is roped off, it is to ensure that our guests’ parking is reserved during town events. Please open and close the rope when parking. Room condition: Your room will contain items such as bedding, towels and other amenities which are in like-new condition. We have provided things such as make-up towels, coasters and luggage racks that will help insure these items remain pristine. Should any items in your room be deemed unusable after your stay, or if excess cleaning of your room is required (e.g. vomit, coffee, wine stains, etc.) the Old Caledonian B&B reserves the right to apply replacement and/or additional charges. Special Diet Accommodation: Special dietary needs are happily accommodated at the Old Caledonian Bed & Breakfast. Please let us know at the time of your reservation, and/or at least 24 hours in advance. Alcoholic Beverages: The Old Caledonian B&B has a great wine and beer list featuring local and other selections. The following are provisions of our liquor license, and are law in the state of Missouri: No alcohol other than wine or beer is allowed on the premises of the Old Caledonian Bed & Breakfast. Any alcohol not purchased from the Old Caledonian Bed & Breakfast cannot be handled by our staff. Storage, chilling, opening, service, etc. of any alcohol not purchased from the Old Caledonian Bed & Breakfast must all be coordinated by the guest. Additional Guest: Depending on available space, we may be able to accommodate a maximum of one additional guest per designated guest room with a roll-in bed. Additional charges apply. Please make arrangements with us at the time of your reservation. Maximum capacity for overnight guests at the Old Caledonian Bed & Breakfast is 12 persons, and guests may stay/sleep in designated guest rooms only. Children Policy: We regret that the Old Caledonian Bed & Breakfast is unable to meet the needs of children under 12 years old for overnight stays. There are no exceptions. Pets Policy: We do not allow pets unless they are certified service animals. A copy of your service animal’s certification paperwork is required. A vest alone will not be accepted as certification. Please let us know at the time of your reservation if your service animal will be accompanying you. Quiet Hours: For the comfort and consideration of all our guests, quiet hours are set between 10pm and 7am. Lost Keys: Lost room keys will result in a locksmith charge. Please have your keys in-hand at checkout. Smoking Policy: Smoking is prohibited in the Old Caledonian Bed & Breakfast’s main house and enclosed buildings. Smoking is allowed in the gazebo, on the patio, and on the grounds themselves. Please dispose of cigarette butts properly and not as littler on the grounds. Any evidence of smoking in guest rooms will result in a $250 fee to the guest’s account. Military Discount: Active military and disabled veterans receive a 10% discount off room prices. We appreciate your service! Non-Discrimination Policy: The Old Caledonian B&B welcomes people of all backgrounds, religions, and orientations for lodging and weddings.